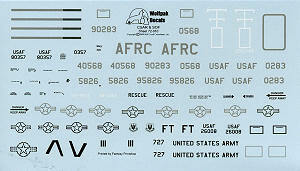 This third new sheet from Wolfpack Decals covers a number of aircraft used in special operations. As is currently the trend, these planes are not exactly the most colorful ever done, but they are important assets and have rarely, if ever, been done on a decal sheet. This sheet contains six subjects, all but one in various shades of grey. As with the previous sheets, these are superbly printed by Fantasy Printshop and without any registration problems. You will find that the carrier film is a bit more than you may be used to, but it is easily trimmed back before use. The initial aircraft is an MC-130E Combat Talon I aircraft from the 711 SOS operating out of Duke Field in 2000. I'm pretty sure that these E model aircraft have been retired by now, but one never really knows. Next an MC-130H Combat Talon II aircraft from the 15 SOS out of Hurlburt Field in 2007. Each of these different Herculese mods in the MC series has different mission equipment for different types of operations. 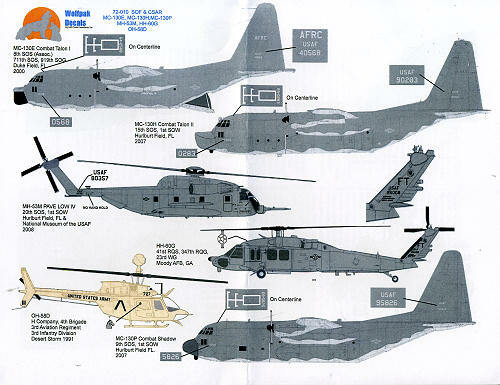 An MH-53M Pave Low IV helicopter is next. This one was operating with the 20 SOS from Hurlburt Field and is now in the USAF Museum. From the 41 RQS based at Moody AFB is this HH-60G. This is the standard SAR helo for the USAF and most major air force bases have at least one squadron or detachment assigned. Our army contingent and lone non-grey aircraft is an OH-58D from the 3rd Avn Reg of the 3rd ID during Desert Storm in 1991. This one is painted in an overall desert tan, a color that tended to weather rather quickly. Finally, an MC-130P with the 9 SOS at Hurlburt Field in 2007. Markings on all these SOS aircraft are minimal at best, keeping with their need to be an 'invisible' as possible.